Caracas – I arrived to Venezuela on Thursday just a few hours after a massive power cut left most of the country in complete darkness. At the airport, long lines of passengers waited as immigration officials registered passports manually in a notebook. Power went out in the afternoon on Thursday and as we drove into Caracas you could see people walking in the dark, struggling to get back home after work because the metro and railway system were out. We already knew the biggest problem in Venezuela these days would be in the hospitals. 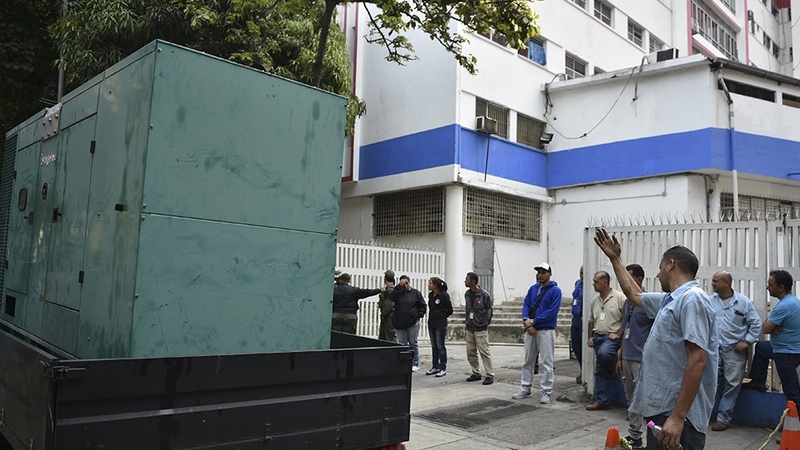 In January, several people died in Caracas University Hospital after a power cut. The power plant was out of service. That’s why on Friday we rushed to check the situation in several of the city’s hospitals. Health officials were trying to cope with the situation and prioritise the Emergency Room and intensive care units. It was not easy. It was there where I met 17-year-old Engibel Gomez who has been fighting cancer for months. She had part of her leg removed because of a tumor. On Friday, she went to the JM Rios hospital in Caracas to get her chemotherapy treatment, but was told it was suspended because of the power cut affecting most the country. “I spent at least three months to begin my chemotherapy because the equipment wasn’t working,” she told me. “Now because of the problem with electricity again the equipment is not working so I cant get my chemo,” she said. Engibel was waiting outside in a car and the only thing she could think of was in the friends she met when she was hospitalised and whose lives depend on an electric power plant. The main problem was at the Guri hydroelectric dam in the state of Bolivar. It supplies around 70 percent of the country’s electric power. Usmeli Romeon’s daughter, Laureani, is 12 years old and suffers from hydrocephaly. She has been in the hospital for a week. Without power most of Caracas remained closed on Friday. The metro and railway system were out of order. The government was forced to shut down schools and suspend working hours. The only few petrol stations that remained open where packed with long lines of vehicles. The opposition led by Juan Guaido said the massive power cut is an example of the corruption and mismanagement that exists in Venezuela today. But the government, led by Nicolas Maduro, and its supporters are convinced it was an act of sabotage led by the United States. There is still no power in several parts of Venezuela, but slowly electricity started to be restored in some parts of Caracas. But the problems are far from over. In the middle of the battle between the Maduro and Guaido, there are people like Engibel Gomez who are suffering the consequences of the ongoing crisis. They are victims of an economic crisis that until now the government has not been able to resolve.